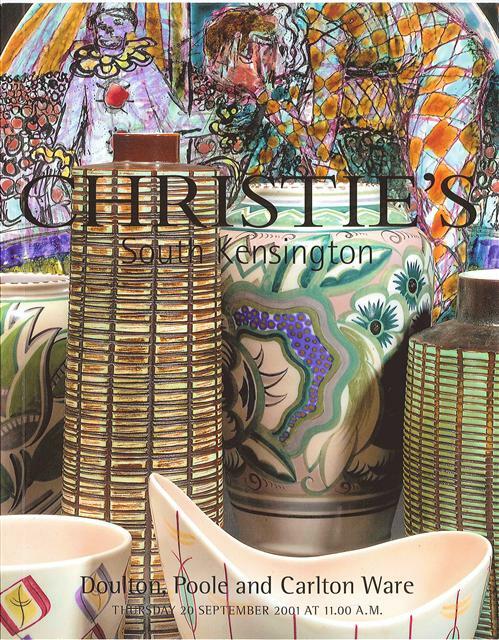 The first national specialised auction dedicated solely to the sale of Poole Pottery was held at Christies South Kensington on 2nd February 1990. A second sale, following on from the popularity of the first was held later in the year. Christies went on to hold annual auctions which were not only an opportunity to buy some good pieces, but also a social event for many collectors and a good excuse for a day out in London. Catalogue for the August 1991 sale. 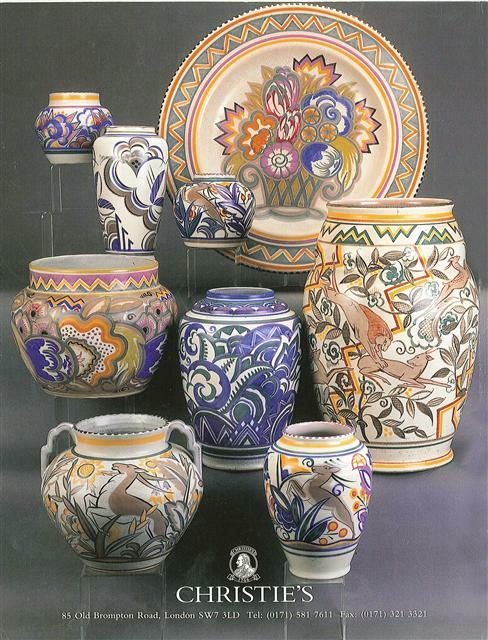 Above - the August 1992 catalogue combined Poole Pottery (relegated to the back page) with Carlton Ware and Doulton which appeared on the front cover. The cover of the 1993 catalogue includes pieces by Guy Sydenham and Tony Morris. 1994 with a good selection of Delphis. 1995 included a TM sheep's head in uranium orange. The 1998 sale included a rare Bushveldt vase. Above - the February 1999 Art Deco sale. Not a specialised Poole sale, but included here because of the nice scimitar vase (one of a pair) on the front cover. Above - the 2001 sale included the Tony Morris clown charger, described by Tony as the best piece that he ever made. The 2000 catalogue has not been included as it did not display any Poole pottery on the outer covers. The last specialised Christie's Poole pottery sale was the Museum and Archive sale in March 2004. How, one might ask, did Poole Pottery come to be selling off the contents of its museum? Cut and paste the link below.